Picking up where we left off, it's time to join the back to the two front pieces. Now, the organza is shifty and stretchy on the bias, so take care not to let it stretch when you pin together your shoulder seams and sew them. I sewed mine at 1/2", trimmed down to 3/8", and tucked in the seam allowance and stitched on top, which is called a false french seam. 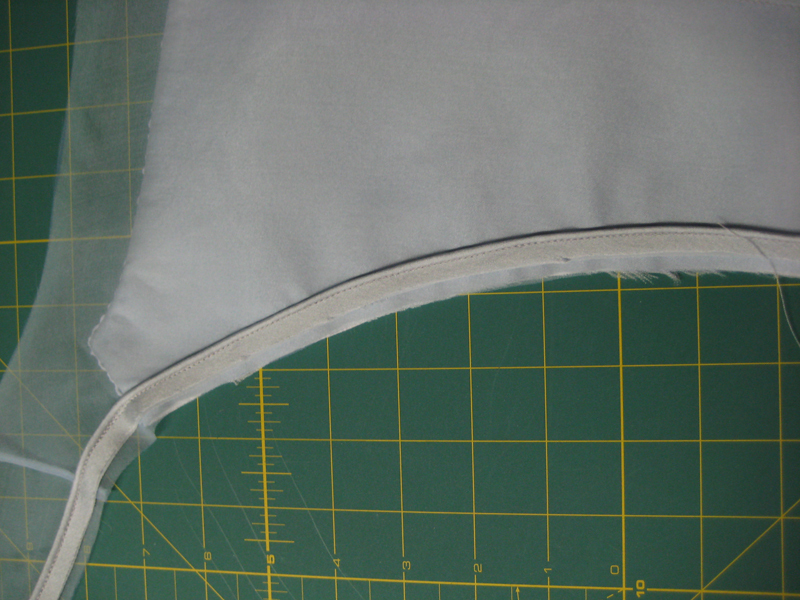 You want this seam to be neat because it will be visible through the fabric. Now for piping. If you've never made piping before, it's fairly simple. You will need 3 lengths of bias from your satin. Bias is cut on the diagonal of the fabric (45 degree angle), and you will need 3 1" wide strips: 2 will need to be the length lining the front side seam along the shoulder and along the back side seam, one continuous length. 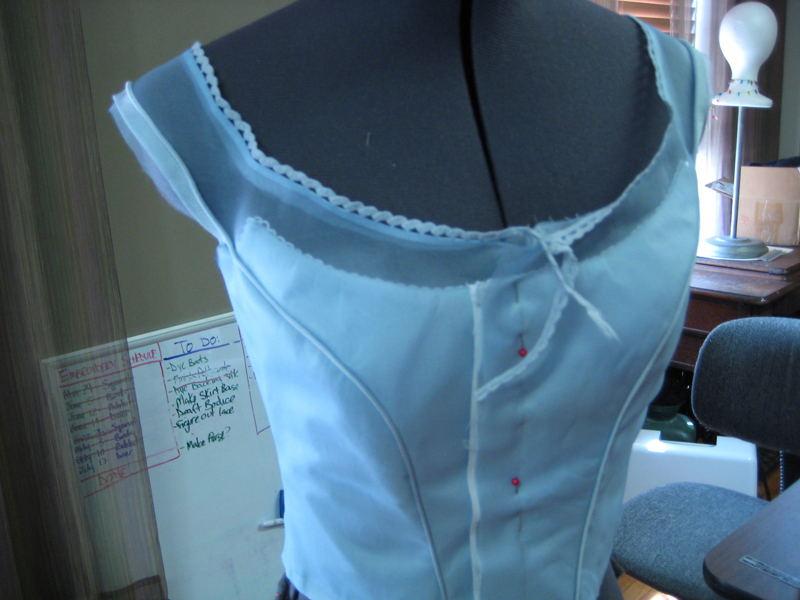 The third will need to be the length of the bottom of your bodice. Make them a little longer just in case. Next, you will put a zipper foot on your machine, and get some ordinary yarn or cording. You don't want it too thick, just ordinary craft yarn. You will then fold the bias over your yarn and stitch as close to the yarn as possible. When you have that done, you will need to sew it to the bodice on the SILK LAYERS only, you will need to move your lining out of the way. This is why, before, you stopped sewing before you hit your seam allowance. When you sew the piping down on the top layer and you get to just the organza on the shoulder, you can stitch one continuous line without hitting the lining. That will come into play later when you attach your other lining pieces. Instead of pining, I found it easier to just line up the stitch lines as I went. 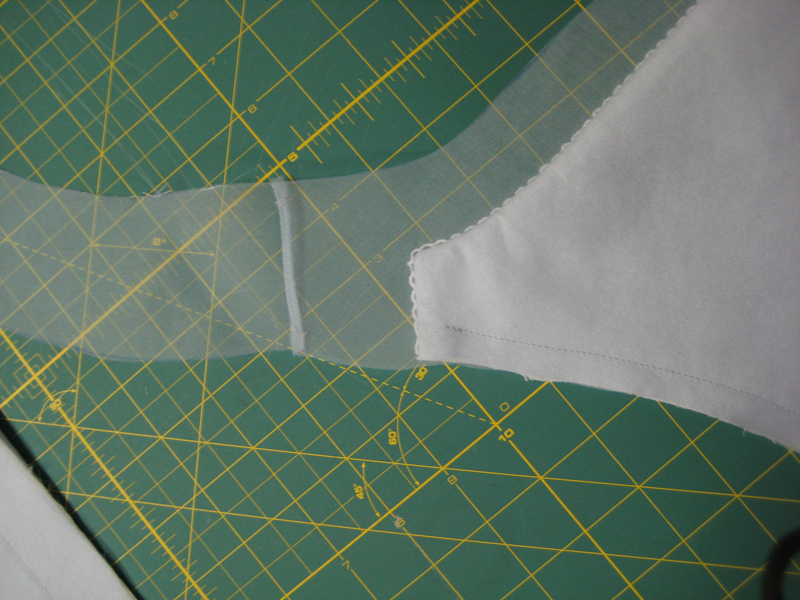 This is also why I flat-lined the organza right on my seam allowance, it gave me a guide to follow. Remember again as you move onto your organza to be sure it doesn't stretch. You can put interfacing behind it too if you wish. 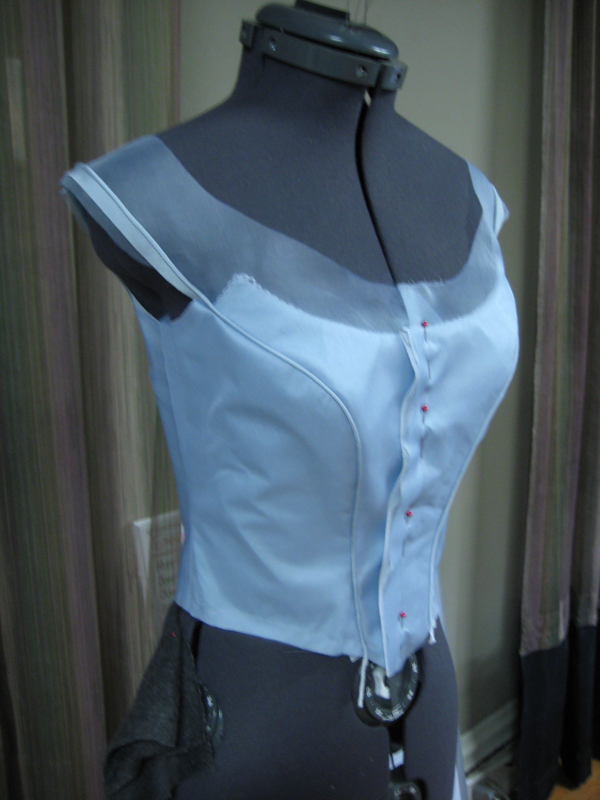 Now you can join your side pieces to the bodice (silk layers only). Note how the seam under the arms extends higher than the opaque layer. That's because the opaque layer is already finished, so don't make the mistake of trying to match them up. 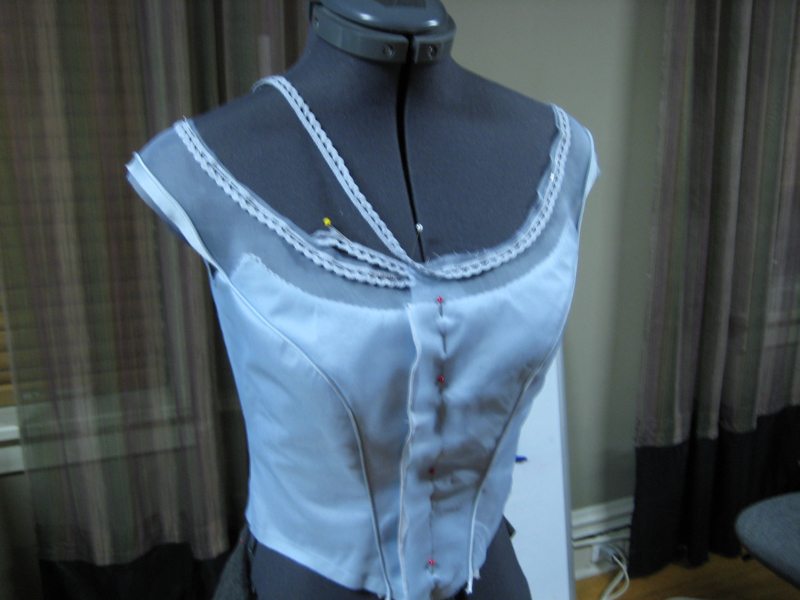 That part will be finished off when we add the sleeves and lining layer. Now you can pin this down center front and try it on or put it on a dummy! What I wanted to do at this point was to finish the neckline. You have to be careful not to fray your neckline while you're working, but if you're careful you should be fine. I tried to do a stay-stitch along one of my necklines to start, but just being organza, it through the shape off horribly, so it's best to just be careful until this point. The reason I didn't finish it when we first joined the shoulder seams was, I felt it would keep it's shape better if I pinned the trim on WHILE it was on the dummy (if you don't have one, put on the bodice and find a trustworthy friend with steady hands!). Finishing it was simple. You will need the cotton scallop trim I'm mentioned in this journal earlier, through which elastic will be threaded that will keep the neckline flat. If you weren't able to find any, you can always finish the edge the same way with thin bias or ribbon or something like that. 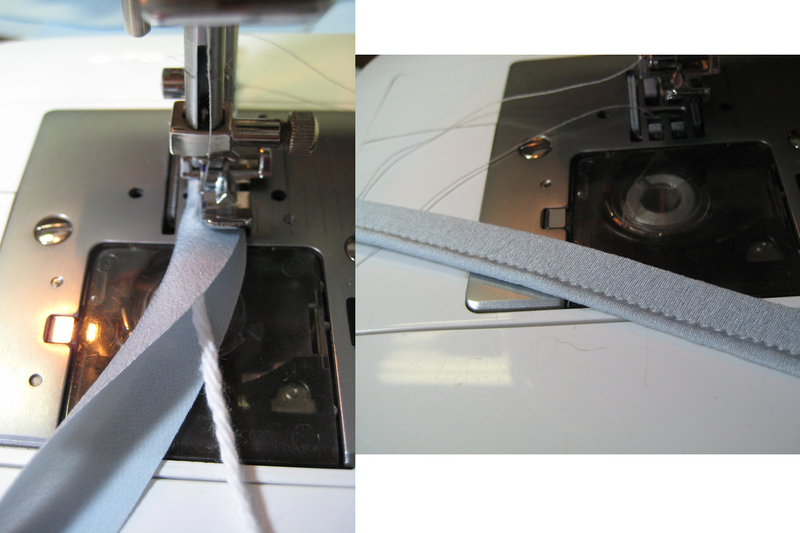 Carefully pin your trim on top, pointed downward, along your neckline. You should have 1/4" or 3/8" seam allowance. You will only go as far as just before center front. I stitched so just the loops would show. Now, you will fold it back and press it, so you have a nice, neat edge. You stopped stitching at center front, but down cut it there as it will later line the organza opening down to the opaque bodice, so leave a few inches and clip the excess. It won't be officially finished off until you put in your closure, but it'll be finished enough for now so it won't fray as you continue working.